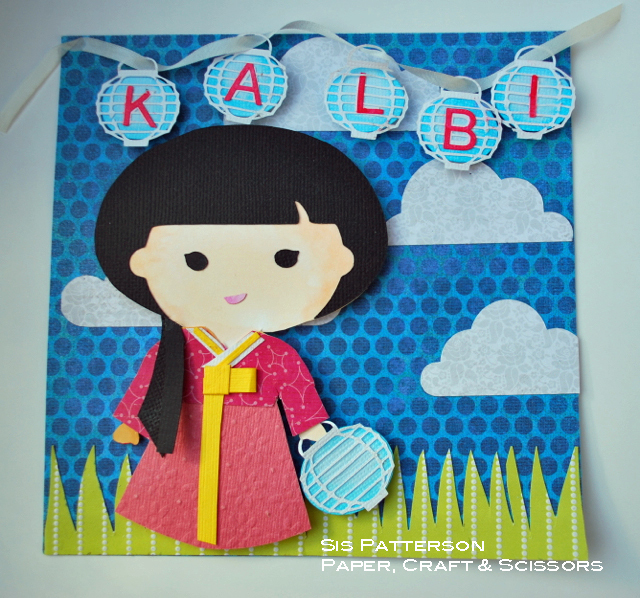 This 6″ x 6″ recipe page uses a “toddler” from Cricut’s Sugar and Spice cartridge and paper lanterns and clouds from the Silhouette on-line store. The young lady’s hanbok (dress) was hand cut using the “toddler” cut as a fitting guide. I trimmed her pig tails off and added the long hair over her shoulder from an “unseen” pony tail in the back. The lanterns were cut on my Silhouette Cameo after welding the “KALBI” letters to each lantern. I used Silhouette Designer Edition software to add the solid lantern behind the white framework. I used Copics to add the color to the lanterns. I separately cut the “KALBI” letters and adhered them to the lanterns over the letter welded to each lantern. This helps keep small pieces aligned properly when gluing. The grassy area was hand cut. I love this color of green as it reminds me of late September in Korea when the rice fields are drained and the rice is almost ready for harvest. For those who may not have had kalbi before, it is grilled thin cross-cut beef ribs (called flanken) with a wonderful marinade. Here is the recipe link from Bon Appetit magazine. Make sure you also click the marinade link in the recipe. Yum! She is adorable!! What time is dinner? Oh!!! Now I know what you meant with your ‘Korean girl’ you referenced in the email. I love her!! How fantastic that you found and created her from Sugar and Spice! I have to take a closer look at that one. Love, love, love the lanterns!! Perfect changes, hair, setting. And can I just say that I love that you know the color of rice fields at harvest. Your palette references are perfect. Everything I know about hanboks I have learned from you. 🙂 We still have Piper’s in her room. She will have it forever. The recipe sounds fantastic!! I have never tried it but I see it in the near future! Thank you for the link. Oh, and I meant to tell you the last time I was here: I love your blog decorated for Christmas! Well, your projects are always a learning experience for me!! Reckon this is what they mean when they talk about “continuing education”?????!! It’s a mystery to me how you can get all those itty bitty tiny pieces to do what you want them to do, but you sure can do it! Thanks for sharing her, & today’s lesson, with us…I love it when I get an email that you have a new project on your blog!! Awww…..she is too adorable. You have become the master of these 6 x 6 canvases. Absolutely adorable. Hope your project is coming along nicely. I know it’s going to be a treasure. Hugs, my friend. Where do you find the time?! She is just so cute!!! I love working on 6×6 size. I really like all the square sizes!